Here’s what I said on Maundy Thursday evening, at our wonderful mass with the washing of feet and the procession of the blessed sacrament to the altar of repose. Last Sunday saw us remember episode 1 of the Holy Week story – the entry of Jesus into Jerusalem. And then, slightly confusing, we got a preview of episode 3, with the reading of the Passion from Matthew’s gospel. It seems a little strange to hear how Jesus dies, and then go back in time to the night before the arrest and crucifixion. But tonight, we go back a step to episode 2 – the Last Supper – before going back to episode 3 again tomorrow. On the night before he died, Jesus washed his disciples’ feet. Afterwards he asked them whether they understood what he had done for them. He knew, by now, that the disciples were pretty slow on the uptake! And so, tonight, we do exactly that. We wash feet – and we do so because Jesus has commanded it. Doing what he commanded his disciples when he said: “So if I, your Lord and Teacher, have washed your feet, you ought also to wash one another’s feet. For I have set you an example, that you should also do as I have done to you”. It has become, for us, a familiar Holy Week ritual – and some will join in while others will sit and watch. And it’s familiarity means that its impact is, perhaps, lost. But just cast your minds back to that upper room two thousand years ago. Imagine you are one of the disciples. How do you think they felt, when Jesus washed their feet? In fact, we do not realise what a staggering thing this must have been for the disciples. Jesus did something unheard of. It was a hot and dusty climate. A servant would pour water over someone’s feet to clean of the dirt and grime and to refresh them – but actually wash them – never. Not even a slave was expected to do this. It’s no wonder that he has to ask them if they understand what he has done for them! For what Jesus did was revolutionary, shocking, and no way for any civilised person to behave – and he asks us to do the same. Peter couldn’t cope with this, and even today, knowing how Jesus rebuked Peter, we still find it hard to be on the receiving end. Often, as Christians, we are called upon to give – of ourselves, of our service, of our possessions – and we do so. But when it comes to being on the receiving end of service it becomes a different matter. Like Peter we find it difficult to receive the love and service of others. 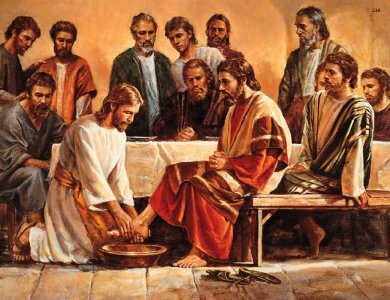 An so Peter remonstrates with Jesus – not my feet, but let me wash your feet! Timmy, misunderstanding his mother, remonstrates with her – I’ve defintely got my shoes on the right feet. Peter, misunderstanding Jesus, thinks that Jesus has got the wrong feet and that he should be washing the feet of Jesus. There is a deep truth to be learned here. At the Last Supper, Jesus was not merely giving the disciples a lesson in practical humility and mutual service, but was revealing to them the true nature of what it meant to be their Master and Lord. God, the true God, the Father of Jesus, is not a god like others that people believed in, demanding first of all the abasement and service of their devotees. He is one who, approaching from beneath, performs a servant’s task for them. He washes their feet, and he offers himself as food for the world. It is then, because of his service to them, that they can understand how things are in God’s world, but only then. For as long as Peter insists on serving Jesus and refuses to allow Jesus to serve him, it is quite impossible for him to have any share in Jesus. Our salvation does not depend on our love for God but upon his love for us – it depends in the first instance upon his willingness to recreate us in his own image and likeness if we will only let him. Timmy knew, even though he thought his mother didn’t, that his shoes were on the right feet! Just as Jesus knew, even if Peter thought he didn’t, exactly which feet needed washing and by whom. And he washed the feet of Peter, and of James and John and of all the others. Just as knows he wants to wash your feet – to give you an example of how to live. To show you how to live out the new commandment of love. Soon Peter will understand – but not yet, not until he has come face to face with the risen Jesus and face to face with his past failure. Unlike Peter and the others in that upper room, although we may find it difficult to understand why our Lord and our God should want to kneel down and perform an act of service like that, we can with the benefit of living after the resurrection, understand the nature of true love and service and begin to see how Jesus, our Lord and God, totally upturns the ways of the world. We can see that Jesus wants to wash our feet. For Jesus shows us a different way – one which starts from a shared vulnerability. One which allows God to kneel at our feet and wash them. One which then calls us to live out that life of commitment to one another. For this is the new commandment of Jesus. Our eucharist here on Maundy Thursday, with its ceremony of the footwashing and the procession to the altar of repose, which represents the Garden of Gethsemane, looks forward to tomorrow’s commemoration of the cost of the new commandment. We are called to serve one another – to love and be loved as Christ taught us and showed us. And we are called to accept the cost of that love and service – the cost of taking up our cross and following Jesus on his journey of suffering. Tonight we come to terms with the reality that Jesus wants to wash our feet – and tomorrow we come to terms with the reality that the cost of presenting the world with this new way of love and service meant. Today it is your feet that he wants to wash, tomorrow it is your sin that he will die for, and as he promised the disciples, it is you for whom he will conquer death.